Sicily (Italian : Sicilia [siˈtʃiːlja] ; Sicilian : Sicilia [sɪˈʃiːlja] ) is the largest island in the Mediterranean Sea and one of the 20 regions of Italy. It is one of the five Italian autonomous regions, in Southern Italy along with surrounding minor islands, officially referred to as Regione Siciliana. Sicilian, also known as Siculo or Calabro-Sicilian, is a Romance language spoken on the island of Sicily and its satellite islands. It is also spoken in southern Calabria, specifically in the Province of Reggio Calabria, whose dialect is viewed as being part of the continuum of the Sicilian language. 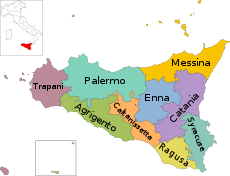 Central Calabria, the southern parts of Apulia and Campania, on the Italian peninsula, are viewed by some as being part of a broader Far Southern Italian language group. Sicily is located in the central Mediterranean Sea, south of the Italian Peninsula, from which it is separated by the narrow Strait of Messina. Its most prominent landmark is Mount Etna, the tallest active volcano in Europe,  and one of the most active in the world, currently 3,329 m (10,922 ft) high. The island has a typical Mediterranean climate. The Italian Peninsula or Apennine Peninsula extends 1,000 km (620 mi) from the Po Valley in the north to the central Mediterranean Sea in the south. The peninsula's shape gives it the nickname lo Stivale. Three smaller peninsulas contribute to this characteristic shape, namely Calabria, Salento and Gargano. The Strait of Messina, is a narrow strait between the eastern tip of Sicily and the western tip of Calabria in the south of Italy. 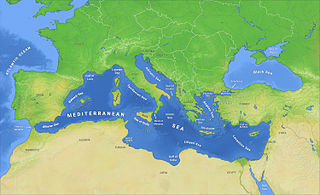 It connects the Tyrrhenian Sea to the north with the Ionian Sea to the south, within the central Mediterranean. 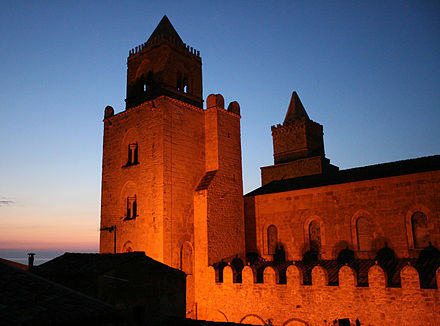 At its narrowest point, between Torre Faro and Villa San Giovanni, it is 3.1 km (1.9 mi) wide. At the town of Messina it is 5.1 km (3.2 mi) wide. The strait's maximum depth is about 250 m (820 ft). The earliest archaeological evidence of human activity on the island dates from as early as 12,000 BC. By around 750 BC, Sicily had three Phoenician and a dozen Greek colonies and, for the next 600 years, it was the site of the Sicilian Wars and the Punic Wars. 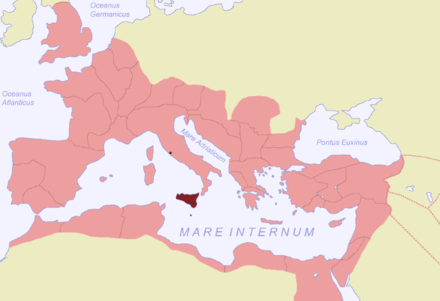 After the fall of the Roman Empire in the 5th century AD, Sicily was ruled during the Early Middle Ages by the Vandals, the Ostrogoths, the Byzantine Empire, and the Emirate of Sicily. 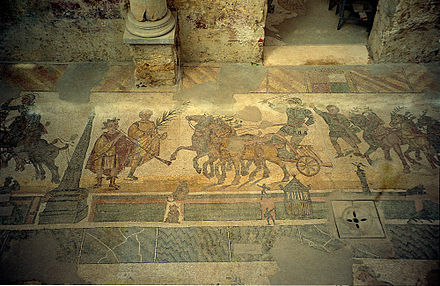 The Norman conquest of southern Italy led to the creation of the Kingdom of Sicily, which was subsequently ruled by the Hohenstaufen, the Capetian House of Anjou, Spain, and the House of Habsburg. It was finally unified under the House of Bourbon with the Kingdom of Naples as the Kingdom of the Two Sicilies. 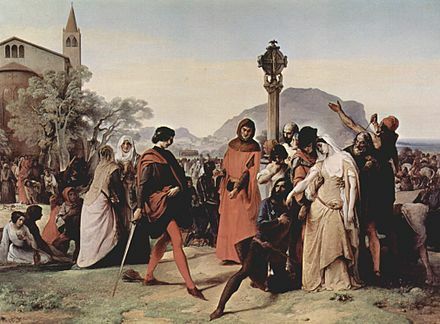 It became part of Italy in 1860 following the Expedition of the Thousand, a revolt led by Giuseppe Garibaldi during the Italian unification, and a plebiscite. Sicily was given special status as an autonomous region on 15th May 1946, 18 days before the Italian constitutional referendum of 1946. Albeit, much of the autonomy still remains unapplied, especially financial autonomy, because the autonomy-activating laws have been deferred to be approved by the parithetic committee (50% Italian State, 50% Regione Siciliana), since 1946. The archaeological record is the body of physical evidence about the past. It is one of the core concepts in archaeology, the academic discipline concerned with documenting and interpreting the archaeological record. Archaeological theory is used to interpret the archaeological record for a better understanding of human cultures. The archaeological record can consist of the earliest ancient findings as well as contemporary artifacts. Human activity has had a large impact on the archaeological record. Destructive human processes, such as agriculture and land development, may damage or destroy potential archaeological sites. Other threats to the archaeological record include natural phenomena and scavenging. Archaeology can be a destructive science for the finite resources of the archaeological record are lost to excavation. Therefore, archaeologists limit the amount of excavation that they do at each site and keep meticulous records of what is found. The archaeological record is the physical record of human prehistory and history, of why ancient civilizations prospered or failed and why those cultures changed and grew. It is the story of the human world. 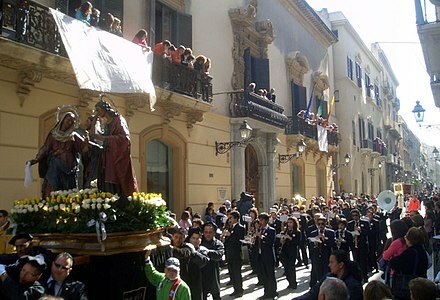 The Music of Sicily refers to music created by peoples from the isle of Sicily. 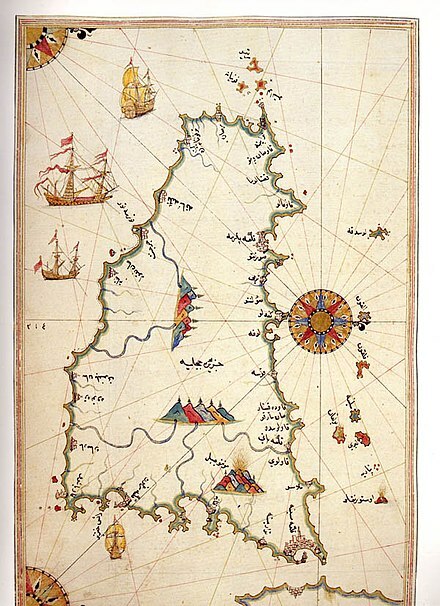 It was shaped by the island's history, from the island's great presence as part of Magna Grecia 2,500 years ago, through various historical incarnations as a part of the Roman Empire, then an integral part of the Kingdom of Sicily, and, finally, as an autonomous region of the modern nation state of Italy. Sicilian cuisine is the style of cooking on the island of Sicily. It shows traces of all cultures that have existed on the island of Sicily over the last two millennia. Although its cuisine has a lot in common with Italian cuisine, Sicilian food also has Greek, Spanish, French and Arab influences. The terrain of inland Sicily is mostly hilly and is intensively cultivated wherever possible. Along the northern coast, the mountain ranges of Madonie, 2,000 m (6,600 ft), Nebrodi, 1,800 m (5,900 ft), and Peloritani, 1,300 m (4,300 ft), are an extension of the mainland Apennines. The cone of Mount Etna dominates the eastern coast. In the southeast lie the lower Hyblaean Mountains, 1,000 m (3,300 ft). The mines of the Enna and Caltanissetta districts were part of a leading sulphur-producing area throughout the 19th century, but have declined since the 1950s. The Madonie are one of the principal mountain ranges on the island of Sicily, located in southwestern Italy. The Nebrodi is a mountain range that runs along the north east of Sicily. Together with the Madonie and the Peloritani, they form the Sicilian Apennines. The Peloritani are a mountain range of north-eastern Sicily, in southern Italy, extending for some 65 km from Capo Peloro to the Nebrodi Mountains. On the north and east they are bordered by the Tyrrhenian and Ionian Seas, respectively, and on the south by the Alcantara River. According to the Regional Agency for Waste and Water, on 10 August 1999, the weather station of Catenanuova (EN) recorded a maximum temperature of 48.5 °C (119 °F). The official European record – measured by minimum/maximum thermometers – is held by Athens, Greece, which reported a maximum of 48.0 °C (118 °F) in 1977. Total precipitation is highly variable, generally increasing with elevation. In general, the southern and southeast coast receives the least rainfall (less than 50 cm (20 in)), and the northern and northeastern highlands the most (over 100 cm (39 in)). No evidence survives of any warring between the tribes, but the Sicanians moved eastwards when the Elymians settled in the northwest corner of the island. The Sicels are thought[ by whom? ] to have originated in Liguria; they arrived from mainland Italy in 1200 BC and forced the Sicanians to move back across Sicily and to settle in the middle of the island. 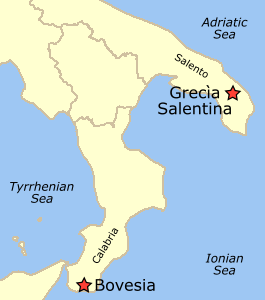 Other minor Italic groups who settled in Sicily included the Ausones (Aeolian Islands, Milazzo) and the Morgetes of Morgantina. The Muslim conquest of Sicily was a see-saw affair and met with much resistance. 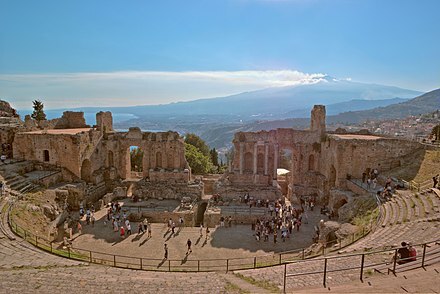 It took over a century for Byzantine Sicily to be conquered; the largest city, Syracuse, held out until 878 and the Greek city of Taormina fell in 962. It was not until 965 that all of Sicily was conquered by the Arabs. In the 11th century Byzantine armies carried out a partial reconquest of the island under George Maniakes, but it was their Norman mercenaries who would eventually complete the island's reconquest at the end of the century. In 1038, seventy years after losing their last cities in Sicily, the Byzantines under the Greek general George Maniakes invaded the island together with their Varangian and Norman mercenaries. Although Maniakes was killed in a Byzantine civil war in 1043 before completing a reconquest, Normans would complete a conquest of Sicily from the Arabs under Roger I. After taking Apulia and Calabria, Roger occupied Messina with an army of 700 knights. In 1068, Roger was victorious at Misilmeri, but the most crucial battle was the siege of Palermo, which led to most of Sicily coming under Norman control in 1072. The Normans finished their conquest in 1091, when they captured Noto, which was the last Arab stronghold. 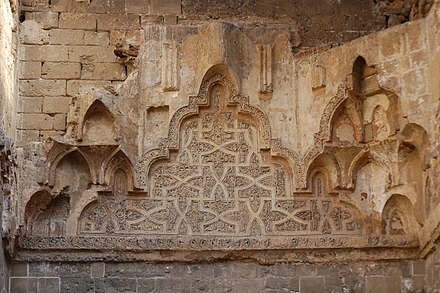 Palermo continued on as the capital under the Normans. The Expedition of the Thousand led by Giuseppe Garibaldi captured Sicily in 1860, as part of the Risorgimento . The conquest started at Marsala, and native Sicilians joined him in the capture of the southern Italian peninsula. 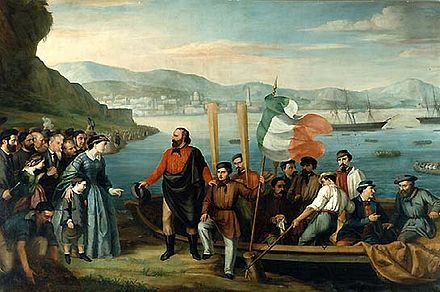 Garibaldi's march was completed with the Siege of Gaeta, where the final Bourbons were expelled and Garibaldi announced his dictatorship in the name of Victor Emmanuel II of Kingdom of Sardinia. Sicily became part of the Kingdom of Sardinia after a referendum where more than 75% of Sicily voted in favour of the annexation on 21 October 1860 (but not everyone was allowed to vote). As a result of the Kingdom of Italy proclamation, Sicily became part of the kingdom on 17 March 1861. Traditionally, Sicily gives centre-right results during election. From 1943 to 1951 there was also a separatist political party called Sicilian Independence Movement (Movimento Indipendentista Siciliano, MIS). Its best electoral result was in the 1946 general election, when MIS obtained 0.7% of national votes (8.8% of votes in Sicily), and four seats. However, the movement lost all its seats following the 1948 general election and the 1951 regional election. Even though it has never been formally disbanded, today the movement is no longer part of the politics of Sicily. 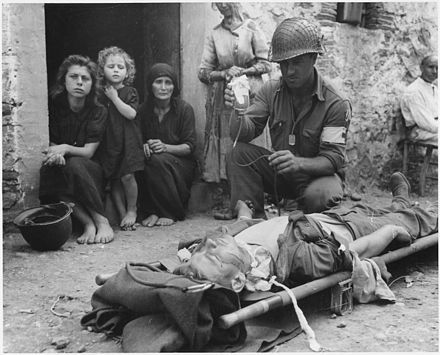 After World War II Sicily became a stronghold of the Christian Democracy, in opposition to the Italian Communist Party. The Communists and their successors (the Democratic Party of the Left, the Democrats of the Left and the present-day Democratic Party) had never won in the region until 2012. Sicily is now governed by a centre-right coalition. Nello Musumeci is the current President since 2017. Highways have recently been built and expanded in the last four decades. The most prominent Sicilian roads are the motorways (known as autostrada) running through the northern section of the island. Much of the motorway network is elevated by columns due to the mountainous terrain of the island. Other main roads in Sicily are the Strade Statali like the SS.113 that connects Trapani to Messina (via Palermo), the SS.114 Messina-Syracuse (via Catania) and the SS.115 Syracuse-Trapani (via Ragusa, Gela and Agrigento). Late Baroque Towns of the Val di Noto (2002) "represent the culmination and final flowering of Baroque art in Europe". It includes several towns: Caltagirone, Militello in Val di Catania, Catania, Modica, Noto, Palazzolo Acreide, Ragusa and Scicli. Terracotta ceramics from the island are well known, the art of ceramics on Sicily goes back to the original ancient peoples named the Sicanians, it was then perfected during the period of Greek colonisation and is still prominent and distinct to this day. Nowadays, Caltagirone is one of the most important centres in Sicily for the artistic production of ceramics and terra-cotta sculptures. 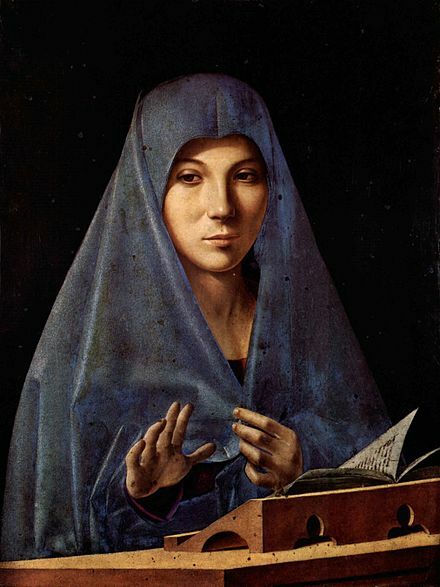 Famous painters include Renaissance artist Antonello da Messina, Renato Guttuso and Greek born Giorgio de Chirico who is commonly dubbed the "father of Surrealist art" and founder of the metaphysical art movement. The most noted architects are Filippo Juvarra (one of the most important figures of the Italian Baroque) and Ernesto Basile. The Sicilian Baroque has a unique architectural identity. Noto, Caltagirone, Catania, Ragusa, Modica, Scicli and particularly Acireale contain some of Italy's best examples of Baroque architecture, carved in the local red sandstone. Noto provides one of the best examples of the Baroque architecture brought to Sicily. The Baroque style in Sicily was largely confined to buildings erected by the church, and palazzi built as private residences for the Sicilian aristocracy. The earliest examples of this style in Sicily lacked individuality and were typically heavy-handed pastiches of buildings seen by Sicilian visitors to Rome, Florence, and Naples. However, even at this early stage, provincial architects had begun to incorporate certain vernacular features of Sicily's older architecture. 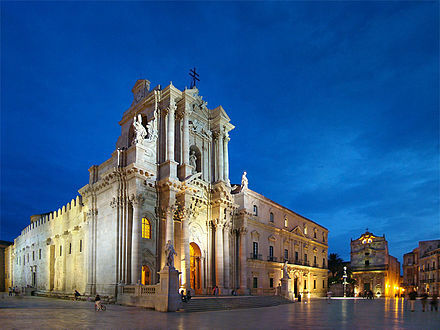 By the middle of the 18th century, when Sicily's Baroque architecture was noticeably different from that of the mainland, it typically included at least two or three of the following features, coupled with a unique freedom of design that is more difficult to characterise in words. 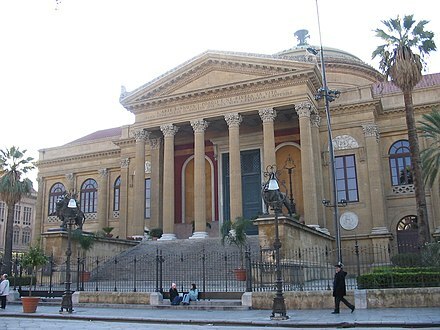 Palermo hosts the Teatro Massimo which is the largest opera house in Italy and the third largest in all of Europe. In Catania there is another important opera house, the Teatro Massimo Bellini with 1,200 seats, which is considered one of the best European opera houses for its acoustics. Sicily's composers vary from Vincenzo Bellini, Sigismondo d'India, Giovanni Pacini and Alessandro Scarlatti, to contemporary composers such as Salvatore Sciarrino and Silvio Amato. Many award-winning and acclaimed films of Italian cinema have been filmed in Sicily, amongst the most noted of which are: Visconti's "La Terra Trema" and "Il Gattopardo", Pietro Germi's "Divorzio all'Italiana " and "Sedotta e Abbandonata ". Sicilian was an early influence in the development of the first Italian standard, although its use remained confined to an intellectual elite. This was a literary language in Sicily created under the auspices of Frederick II and his court of notaries, or Magna Curia, which, headed by Giacomo da Lentini, also gave birth to the Sicilian School, widely inspired by troubadour literature. Its linguistic and poetic heritage was later assimilated into the Florentine by Dante Alighieri, the father of modern Italian who, in his De vulgari eloquentia , claims that "In effect this vernacular seems to deserve a higher praise than the others, since all the poetry written by Italians can be called Sicilian". It is in this language that appeared the first sonnet, whose invention is attributed to Giacomo da Lentini himself. Syracuse is also an experimental centre for the solar technologies through the creation of the project Archimede solar power plant that is the first concentrated solar power plant to use molten salt for heat transfer and storage which is integrated with a combined-cycle gas facility. All the plant is owned and operated by Enel. The touristic town of Erice is also an important science place thanks to the Ettore Majorana Foundation and Centre for Scientific Culture which embraces 123 schools from all over the world, covering all branches of science, offering courses, seminars, workshops and annual meetings. It was founded by the physicist Antonino Zichichi in honour of another scientist of the island, Ettore Majorana known for the Majorana equation and Majorana fermions. 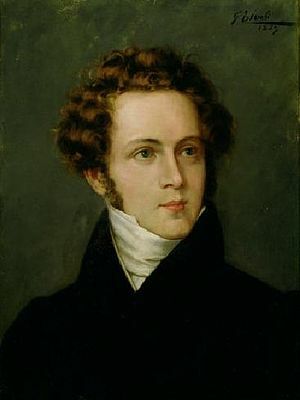 Sicily's famous scientists include also Stanislao Cannizzaro (chemist), Giovanni Battista Hodierna and Niccolò Cacciatore (astronomers). 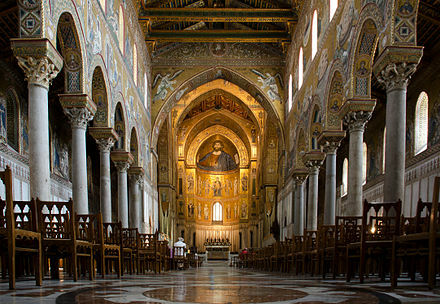 As in most Italian regions, Christian Roman Catholicism is the most predominant religious denomination in Sicily, and the church still plays an important role in the lives of most people. Before the invasion of the Normans, Sicily was predominantly Eastern Orthodox, of which few adherents still remain today. There is also a notable small minority of Eastern-rite Byzantine Catholics which has a mixed congregation of ethnic Albanians; it is operated by the Italo-Albanian Catholic Church. Most people still attend church weekly or at least for religious festivals, and many people get married in churches. There was a wide presence of Jews in Sicily for at least 1,400 years and possibly for more than 2,000 years. Some scholars believe that the Sicilian Jewry are partial ancestors of the Ashkenazi Jews. However, much of the Jewish community faded away when they were expelled from the island in 1492. Islam was present during the Emirate of Sicily, although Muslims were also expelled. Today, mostly due to immigration to the island, there are also several religious minorities, such as Jehovah's Witnesses, Islam, Judaism, and Sikhism. There are also a fair number of Evangelical Church members and practitioners who live on the island. Palermo and Catania have a heated rivalry and compete in the Sicilian derby together. Palermo is the only team in Sicily to have played on the European stage, in the UEFA Cup. In the island, the most noted footballer is Salvatore Schillaci, who won the Golden Boot at the 1990 FIFA World Cup with Italy. Other noted players include Giuseppe Furino, Pietro Anastasi, Francesco Coco, Christian Riganò, and Roberto Galia. There have also been some noted managers from the island, such as Carmelo Di Bella and Franco Scoglio. Familiar as an ancient symbol of the region, the Triskelion is also featured on Greek coins of Syracuse, such as coins of Agathocles (317–289 BC).The symbol dates back to when Sicily was part of Magna Graecia, the colonial extension of Greece beyond the Aegean. The triskelion was revived, as a neoclassic – and non-Bourbon – emblem for the new Napoleonic Kingdom of the Two Sicilies, by Joachim Murat in 1808. Pliny the Elder attributes the origin of the triskelion of Sicily to the triangular form of the island, the ancient Trinacria, which consists of three large capes equidistant from each other, pointing in their respective directions, the names of which were Pelorus, Pachynus, and Lilybæum. The three legs of the triskelion are also reminiscent of Hephaestus's three-legged tables that ran by themselves, as mentioned in Iliad xviii. The Sicilian cart is an ornate, colourful style of horse or donkey-drawn cart native to Sicily. Sicilian wood carver George Petralia states that horses were mostly used in the city and flat plains, while donkeys or mules were more often used in rough terrain for hauling heavy loads. The cart has two wheels and is primarily handmade out of wood with iron components. Sicilians or the Sicilian people are the Romance-speaking ethnic group indigenous to the Italian island of Sicily, the largest island in the Mediterranean Sea as well as the largest and most populous of the autonomous regions of Italy. Trapani is a province in the autonomous island region of Sicily, southern Italy. Following the suppression of the Sicilian provinces, it was replaced in 2015 by the Free municipal consortium of Trapani. Its capital is the city of Trapani. It has an area of 2,469.62 square kilometres (953.53 sq mi) and a total population of 433,826 (2017). There are 24 comunes in the province. Arancini are stuffed rice balls which are coated with bread crumbs and then deep fried. The most common filling are: "al ragù" or "al sugo", filled with ragù, mozzarella and/or caciocavallo cheese, and often peas and "al burro" or "'a bburro" filled with ham and mozzarella or besciamella. Aci Castello is a comune in the Metropolitan City of Catania in Sicily, Italy. The city is located 9 kilometres (6 mi) north of Catania on the Mediterranean coast. The primary economic sectors are agriculture and industry. 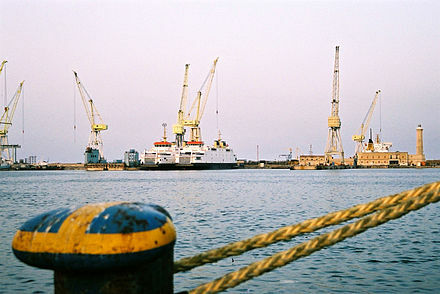 The city is neighbored by Aci Catena, Acireale, Catania, San Gregorio di Catania and Valverde. Fiumefreddo di Sicilia is a comune in the Metropolitan City of Catania on the coast of the Ionian Sea on the island of Sicily, southern Italy. It shares its borders with the municipalities of Calatabiano to the north, Mascali to the south and Piedimonte Etneo to the west. 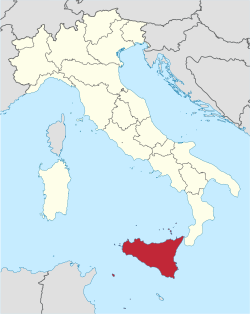 Novara di Sicilia is a comune (municipality) in the Metropolitan City of Messina in the Italian region of Sicily, located about 160 kilometres (99 mi) east of Palermo and some 40 kilometres (25 mi) southwest of Messina. The history of Islam in Sicily and Southern Italy began with the first Muslim settlement in Sicily, at Mazara, which was captured in 827. The subsequent rule of Sicily and Malta started in the 10th century. 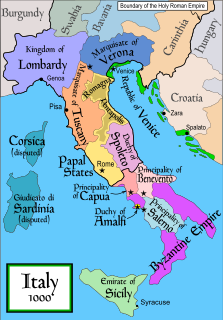 Islamic rule over all Sicily began in 902, and the Emirate of Sicily lasted from 965 until 1061. Though Sicily was the primary Muslim stronghold in Italy, some temporary footholds, the most substantial of which was the port city of Bari, were established on the mainland peninsula, especially in mainland Southern Italy, though Muslim raids reached as far north as Rome and Piedmont. The Muslim raids were part of a larger struggle for power in Italy and Europe, with Christian Byzantine, Frankish, Norman and local Italian forces also competing for control. Muslims were sometimes sought as allies by various Christian factions against other factions. The history of the Jews in Sicily deals with Jews and the Jewish community in Sicily which possibly dates back two millennia. Sicily is a large island off the Southern Italian coast. There has been a Jewish presence in Sicily for at least 1400 years and possibly for more than 2000 years. The following is a timeline of the history of the city of Palermo, Sicily, Italy. The Metropolitan City of Palermo is a metropolitan city in Sicily, Italy. Its capital is the city of Palermo. 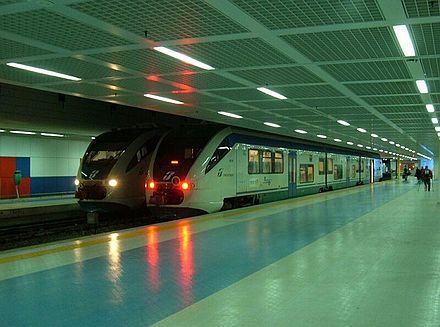 It replaced the Province of Palermo and comprises the city of Palermo and other 82 municipalities (comuni). The following is a timeline of the history of the city of Catania in the Sicily region of Italy. The following is a timeline of the history of the city of Messina, Sicily, Italy. The following is a timeline of the history of the city of Trapani, Sicily, Italy. Asmundo is an old Sicilian noble family that has played a notable role in the island's political, cultural, and economic history. 1 2 "GDP per capita in 276 EU regions: Regional GDP per capita ranged from 29% to 611% of the EU average in 2016". Eurostat News Release (33). 28 February 2018. ↑ Maric, Vesna (2008). Sicily. Ediz. Inglese. google.it. ISBN 9781740599696. ↑ Bain, Keith; Bramblett, Reid; Bruyn, Pippa de; Nadeau, Barbie Latza; Fink, William (2006-08-07). Pauline Frommer's Italy. google.it. ISBN 9780471778608. ↑ Fine, John Van Antwerp (1983). The Ancient Greeks: A Critical History. Harvard University Press. ISBN 9780674033146. ↑ Piccolo, Salvatore; Darvill, Timothy (2013). 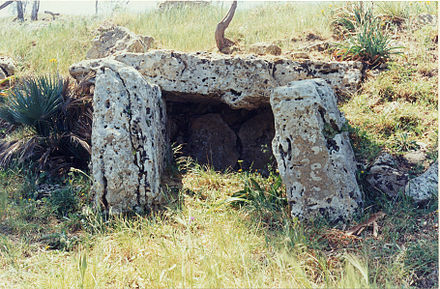 Ancient Stones, The Prehistoric Dolmens of Sicily. Thornham/Norfolk: Brazen Head Publishing. ISBN 9780956510624 . Retrieved 17 October 2013. ↑ Piccolo, Salvatore; Woodhouse, Jean (2013). Ancient Stones: The Prehistoric Dolmens of Sicily. ISBN 9780956510624. 1 2 3 Herbermann, Charles, ed. (1913). "Sicily" . Catholic Encyclopedia . New York: Robert Appleton Company. 1 2 3 Privitera, John (2002). Sicily: An Illustrated History. Hippocrene Books. ISBN 978-0-7818-0909-2. ↑ Davis-Secord, Sarah (2017). Where Three Worlds Met: Sicily in the Early Medieval Mediterranean. Ithaca: Cornell University Press. p. 79. doi:10.7591/j.ctt1qv5qfp (inactive 2019-01-20). ISBN 9781501704642. JSTOR 10.7591/j.ctt1qv5qfp. ↑ Norwich, John Julius (1992). The Normans in Sicily: The Normans in the South 1016–1130 and the Kingdom in the Sun 1130–1194. Penguin Global. ISBN 978-0-14-015212-8. ↑ Taylor, Julie (19 August 2003). Muslims in Medieval Italy: The Colony at Lucera. Lexington Books. ISBN 9780739157978 – via Google Books. ↑ "fascio siciliano". Encyclopædia Britannica . 7 October 2007. ↑ "Disastro Sicilia: In fuga i suoi figli". ↑ "Emigrazione, fuga dalla Sicilia: Ogni anno cancellato un paese di ventimila abitanti". ↑ Oggi la chiamano Etna Valley: i progetti, le aziende, il lavoro nel territorio di Catania Archived 27 May 2010 at the Wayback Machine . Etnavalley.com (27 November 2012). Retrieved on 18 December 2012. ↑ "Regional Unemployment by NUTS2 Region". Eurostat. ↑ Taormina and Isola Bella – World Heritage Site – Pictures, info and travel reports Archived 12 September 2012 at the Wayback Machine . World Heritage Site. Retrieved on 18 December 2012. 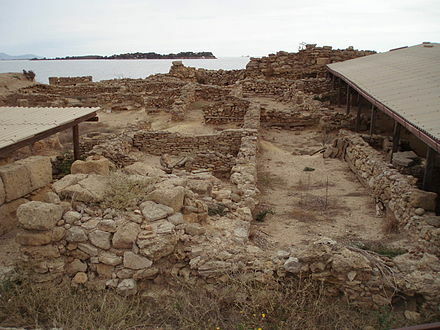 ↑ Mothia and Libeo Island: The Phoenician-Punic Civilization in Italy – World Heritage Site – Pictures, info and travel reports Archived 24 May 2013 at the Wayback Machine . World Heritage Site. Retrieved on 18 December 2012. ↑ Calinger, Ronald S (1999). A Contextual History of Mathematics. Prentice Hall. ISBN 978-0-02-318285-3. ↑ Alighieri, Dante (1996-10-10). De vulgari eloquentia. Cambridge University Press. ISBN 978-0-521-40064-0. ↑ Archimede Archived 24 February 2012 at the Wayback Machine . Enel.com. Retrieved on 18 December 2012. ↑ Nebel, A; Filon, D; Brinkmann, B; Majumder, P; Faerman, M; Oppenheim, A (2001). "The Y Chromosome Pool of Jews as Part of the Genetic Landscape of the Middle East". The American Journal of Human Genetics. 69 (5): 1095–112. doi:10.1086/324070. PMC 1274378 . PMID 11573163. ↑ "Sicilian Cooking Class in Taormina". 2018-03-08. ↑ Piras, Claudia and Medagliani, Eugenio (March 2007). Culinaria Italy. 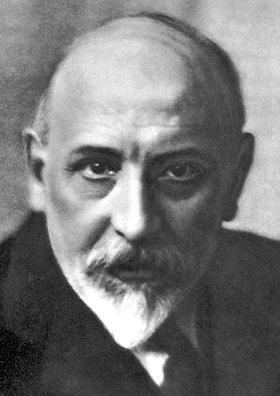 Konemann. ISBN 978-3-8331-3446-3. ↑ UNESCO Culture Sector. "El teatro de marionetas siciliano Opera dei Puppi" . Retrieved 22 August 2010. Wikimedia Commons has media related to Sicily . Wikivoyage has a travel guide for Sicily .